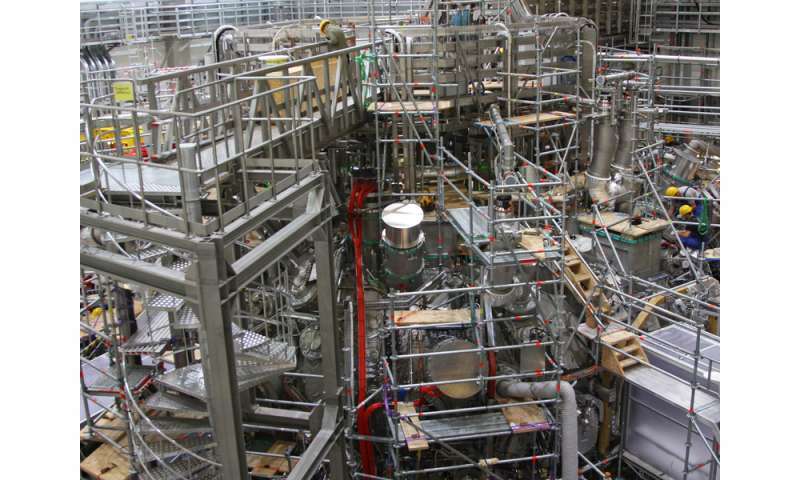 Following nine years of construction work and one year of technical preparations and tests, on 10 December 2015 the first helium plasma was produced in the Wendelstein 7-X fusion device at the Max Planck Institute for Plasma Physics (IPP) in Greifswald. The production of the first hydrogen plasma followed on 3 February 2016 and marked the start of the experimental operation of the device. The purpose of the Wendelstein 7-X, the world's largest stellarator-type fusion device, is to investigate the suitability of this configuration for use in a power plant. The assembly of the Wendelstein 7-X started in April 2005: the centrepiece of the device is a ring consisting of 50 approximately 3.5-metre-tall superconducting magnetic coils. Their special shapes are the result of elaborate optimization calculations carried out by the IPP's "Stellarator Theory" division and the quest for a particularly effective heat-insulating magnetic cage that took over ten years. The coils are threaded onto a steel plasma vessel and enclosed in a ring-shaped steel casing. In their vacuum-pumped interior space, the coils are cooled down to a superconduction temperature close to absolute zero using liquid helium. Thus, they consume practically no energy once they are switched on. The magnetic cage generated by them can keep the 30 cubic metres of ultra-thin plasma suspended continuously, i.e. for up to 30 minutes. Following a construction period of nine years and over one million assembly hours, the main work involved in the assembly of the Wendelstein 7-X was completed in April 2014. Preparation for the operation of the device then began: all of the technical systems were tested in turn – the vacuum in the vessels, the cooling system, the superconducting coils and the magnetic field they generate, the control system, and the heating and measuring devices. It was decided to use helium as a working gas for the launch of the device, as the noble gas is easier to ionize than the subsequent test object hydrogen. Hydrogen forms molecules that must first be broken up by the microwaves, and then tend to react chemically with the wall of the vessel. This can be avoided with the chemically-inert atomic helium. As a result, a plasma can be developed more easily and safely than with hydrogen. In addition, the heavy helium ions are more efficient when it comes to cleaning the vessel walls, on which water and tiny dirt particles had accumulated during the lengthy assembly period. This emerged clearly from the subsequent approximately 300 helium discharges carried out in the Wendelstein 7-X. The cleaner the vessel walls, the higher the temperature attained by the plasma. In addition, the microwave heating and data recording were tested during these initial discharges and the measuring instruments for observing the plasma were operated for the first time. These include the interferometer, laser scattering and video diagnostics, and the x-ray spectrometer. The discharges were characterized by very high electron temperatures at the beginning of the microwave pulse – approximately 10 keV, i.e. 100 million degrees Celsius at a density of around 1019 particles per cubic metre and four megawatts of microwave output, followed by increasing densities and ion temperatures of up to 1020 particles per cubic metre and 2 keV (Fig. 2). The moderate temperatures measured on the wall covering indicate that stationary conditions were not yet reached and a large proportion of the heat power is used to increase the plasma energy. The generation of the first hydrogen plasma followed on 3 February 2016 as part of a ceremonial event with a large number of guests from the fields of science and politics (Fig. 3). When German Federal Chancellor Dr Angela Merkel pressed the button, a 2-megawatt pulse from the microwave heating system transformed approximately one milligram of hydrogen gas into an ultra-thin hot hydrogen plasma. 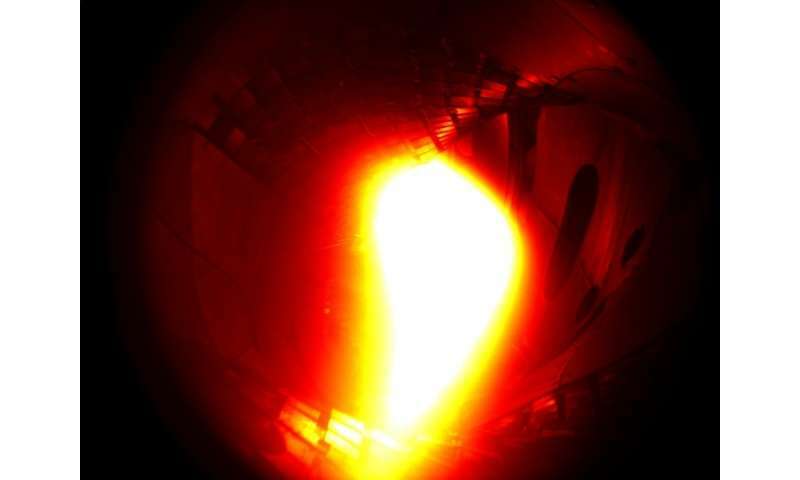 The plasma ions reached a temperature of around 10 million degrees Celsius and the plasma electrons reached a temperature of around 100 million degrees Celsius. The aim of the international fusion research is to develop a climate- and environmentally-friendly power station which generates energy using the fusion of atomic nuclei. Two different configurations have emerged for the magnetic cage, the tokamak and the stellarator. The IPP is the only institute in the world that is testing the two different types simultaneously: the Wendelstein 7-X stellarator in Greifswald (Fig. 4) and the ASDEX Upgrade tokamak in Garching. This enables the direct comparison of the two configurations. The current view is that an energy-producing plasma can only be generated by a tokamak – the international test[IM1] reactor ITER, which is currently being under construction as a global cooperative project in Cadarache. The Wendelstein 7-X, the world's biggest stellarator-type fusion device, will not generate any energy; however, the system should demonstrate that stellarators are also capable of becoming power stations. With the Wendelstein 7-X, it is intended to show for the first time that a stellarator can achieve the same plasma containment quality as a tokamak. With the Wendelstein 7-X's 30-minute-long discharges, it is intended to demonstrate the key advantage of the stellarator: i.e. the capacity to operate for extended periods. As opposed to this, without complicated additional measures, tokamaks can only work in pulses. The modular coils for the generation of the magnetic field play a key role in attaining this objective. 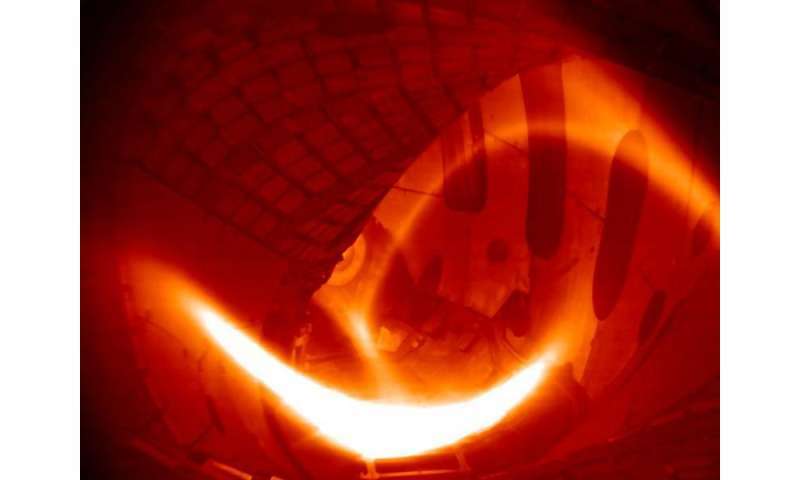 Thanks to their curved shape, they generate the entire magnetic field and dispense with the need for a current in the plasma as required by the tokamak. Moreover, thanks to the irregular coils, the stellarator's magnetic field can be generated relatively freely so that its local strength and curvature can be optimally adapted to the physical laws of the hot plasma. The optimized magnetic field should fulfil seven of the requirements identified for a power plant at once: first, the plasma pressure should have a low retroactive effect on the containing magnetic field and, second, a high quality magnetic field and resilience to possible magnetic field perturbations are required. Third, the energy density of the plasma needed for the economically viable operation of a power station with a sufficiently low magnetic field must be provided. Fourth, the plasma heat loss should be in the right range – the heat losses in the earlier stellarator models were unacceptably high. Fifth, the so-called "bootstrap" current must be negligible. This ring current arises through the drop in radial density and temperature and could cause the undesirable deformation of the magnetic field. Sixth, fast particles must also be well contained – a particularly weak point in the "classic" stellarators. In a future power plant, the rapid helium nuclei that arise during fusion must keep the plasma at fusion temperature when the external heating is switched off. Seventh, and finally, it must be possible to construct the magnetic field cage using a system of modular superconducting coils in a way that is as technically simple and cost-effective as possible. These seven criteria required the formulation of complex new computer codes. Another prerequisite was the development of suitable computing methods to channel the large codes through the computer at an acceptable speed. This optimization was only possible thanks to the development of the 1980s generation of supercomputers. The experiments started in February and continued until March 2016. After that, it was planned to open the plasma vessel again to enable the installation of carbon tiles to protect the vessel walls. This will make it possible to reach higher heat power, higher temperatures and longer discharges of around one second. Further phased developments are planned until 30-minute discharges can be generated in approximately four years' time, and it will be possible to test whether the Wendelstein 7-X can fulfil its optimization targets at a full heat power of 20 megawatts.